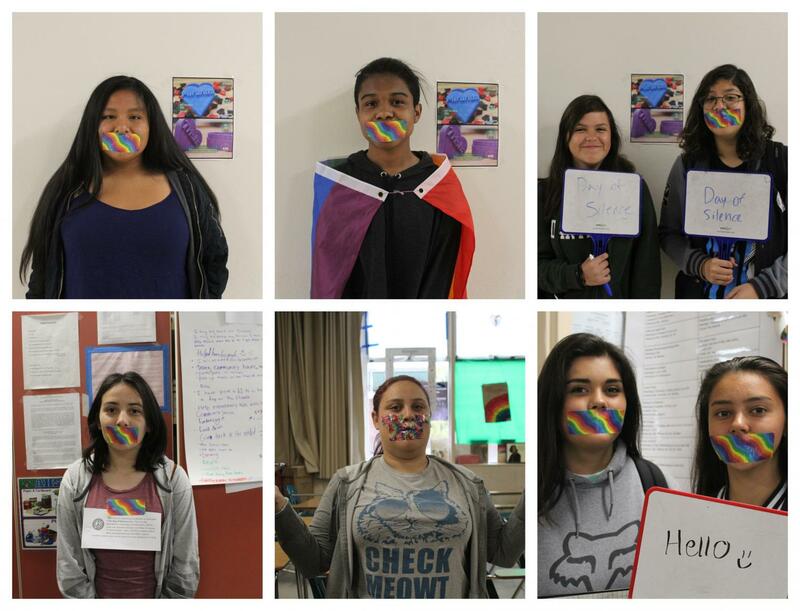 Be Yourself Club members along with other students show their respect during the Day of Silence by using rainbow colored tape and white boards. The Day of Silence is a day in which people choose to be silent in recognition of how the LGBTQ+ community has been silenced throughout their history. The event is a national day of action led by GLSEN ( the Gay, Lesbian, and Straight Education Network). Thousands of schools in the United States take part in this event, consisting mostly of middle and high school students. The goal of each individual who participates is to raise awareness on the issue of bullying that is happening right in front of our eyes. This was the fourth year that Alisal’s Be Yourself Club, along with other students, took part in this event. Their purpose in doing so is to raise awareness about the challenges the LGBTQ+ community faces in their everyday life. Natalie Bernasconi, the Be Yourself Club advisor, likes seeing many students take action towards making a positive change. “I feel proud because it is not an easy thing to do. It makes them very visible. They are taking a stand against those who are silenced,” she says. To “be silenced” is to not be able to express one’s true self. LGBTQ+ people are usually silenced with verbal, physical, cyber, mental, and emotional bullying all at once. “No one knows what each person is going through, they might be hurting so bad due to bullying in any shape or form. LGBTQ+ people feel twice as much pain, bullies get happy when they see you cry,” says Victor Murillo, better known as River. Just like River, many of us have seen bullies rejoice from hurting others and not being able to do much to stop it. The best thing we can do is be a person of trust for anyone who needs a friend in their life. The Be Yourself Club allows students to express themselves freely, which is why students love being members of it. However, the club also focuses on serious areas, such as bullying. Bullying is what drives people to act and strive to make a change. Most of the club members have experienced bullying, so the event is truly meaningful to them. 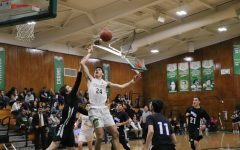 “There is bullying at Alisal, but people do not personally see it and no one reports it. When someone does speak up, the school does nothing or something very small about it,” says Kimberly Sanchez, a club member. The club members along with many other people have the struggle of dealing with bullying on a daily basis. Iris Lopez, the club president, speaks from personal experience when she advises everyone to not let bullying take over one’s life. “Take a break and surround yourself with people who support you, but remember you will always have yourself. A certain song can get you through bullying, or a stuffed animal, a movie, listening to music, drawing, writing, or any coping mechanisms. Have a safe plan,” she says. River feels proud when she sees students walking around campus wearing rainbow flags around their body or covering their mouths with rainbow colored tape on the Day of Silence. She too has strong opinions on the topic of bullying. “I do not comprehend it. I do not know why people feel the need to hurt others. It does not mean you should attack someone just because you feel like doing so. I am glad people are raising awareness on this issue,” says River. Overall, the day was a success. Most participants managed to remain silent throughout the school day and were noticed by others. People who were not aware about the Day of Silence learned its purpose, which helped spread the word and raise awareness. Although it was a “challenge”, as Martinez put it, it was definitely worth the dedication and the small sacrifice of not being able to speak for many hours. This goes to show how important it is to not be a bully and to always show empathy and respect towards others. As they say, think before you speak.